This is just some of the things you will discover. 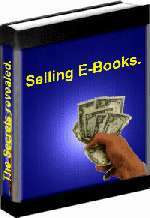 You will find out the secrets of having a successful career on eBay by doing nothing but sell E-Books. It will show you how to make Â£100s every week for no more than 2 hours work a day. Usually less. You will find out when and where to list. You will find out how to attract more customers than most other eBayers. You will find out how to bring back customers again and again. You will find out when to go featured and when to go for a single listing. You will find out when to price low and when to price high. You will find out some secrets even the experienced powersellers don't know. You will find out how to set up everything automatically from delivery to taking care of invoices and feedback. You will find out the secrets of excellent feedback and how to avoid negatives. This is not the usual make money crap. All this is from an experienced seller who makes $100s a week on eBay selling E-Books. And he shows you how he does it.Â Also, unlike many E-Books telling you how to make money this one comes with proof. eBay feedback can't lie and the author's feedback is there for all to see. There is nothing better than getting up in the morning to see you have sold a bundle of E-Books and they have been delivered to your customer, positive feedback has been left and you have done the same in return. All while you have been asleep!